My mother-in-law, who lives in a tiny village in Goa, serves these black-eyed peas piping hot for breakfast. On my visits there, I love to sit down to a steaming bowl with some freshly baked bread and listen to the sounds of the village waking up all around me: the baker making his morning rounds on his bicycle, the fisherwomen bustling into the village square, and the children noisily arriving at the school opposite. 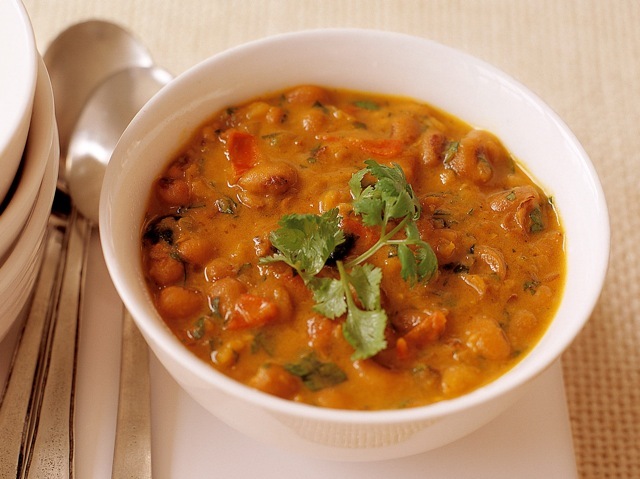 You can serve this with chapatis or steamed rice, or simply on its own as a satisfying soup for lunch. If using dried black-eyed peas, soak them in water to cover for 6 to 8 hours. Drain. In a large saucepan, heat the oil over medium-low heat and sauté the onion until it turns dark brown, about 8 minutes. Add the coriander, garlic, ginger, turmeric, cayenne, and cumin, and stir for 2 minutes. Add the tomato and stir over low heat until it disintegrates. Add the peas and mix well. Pour in the water, add the salt and sugar, and bring to a boil. Turn the heat down to low, cover, and simmer until the peas are cooked through, about 20 minutes. If using canned peas, simmer for only 10 minutes (it is essential to simmer the canned peas too so that the flavors blend better). Stir in the coconut milk and simmer for another 8 to 10 minutes, again allowing the flavors to come together. Add the cilantro and lemon juice, simmer for 1 minute more, and remove from the heat. Serve immediately.